I have an assortment of pegs I choose each trip based on conditions. If I am going to be in exposed conditions for my overnights, on the tops and expecting high wind/rain, I will take MSR large Groundhogs. If summer, bush conditions, titanium shepards hooks. MSR now do the groundhogs in mini style. This allows better options at lighter weights. I just purchase the mini Groundhogs and feel they will work well with all situations if "mixed and matched". For my Hexamid Zpacks Solo or Twin Tarp, I will now be taking a standard set up of 6 mini Groundhogs and 2 large. The total peg weigh is 90g including the cuben fibre storage sack. I've included a photo below - the mini groundhogs are on the left with a matchbox to give size comparison. 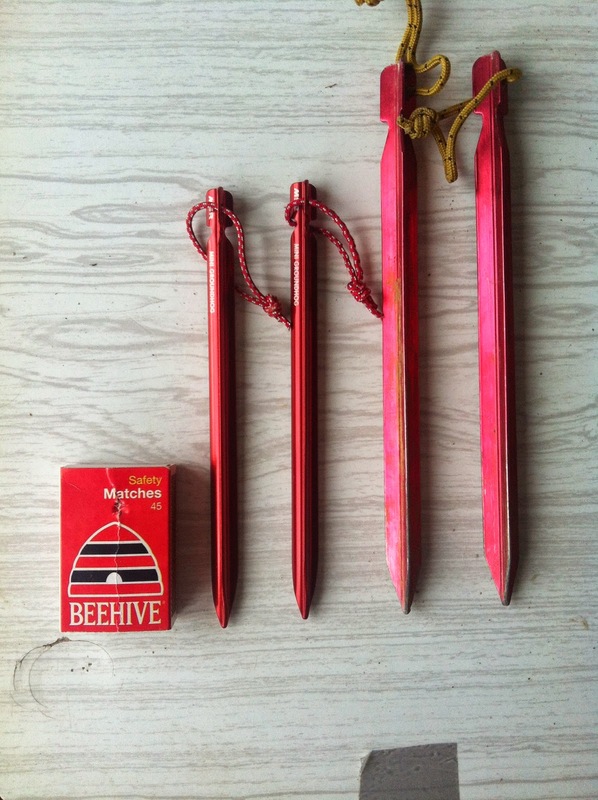 I use the two large one for the front and rear anchor points of my Hexamid Tarp. I use the same system myself, 2 long pegs and four short pegs. It works really well.